At a joint news conference in Berlin, she said if Europe wanted to retain its soul it could not ignore people's needs and suffering. But Mr Orban said the best way to be humane was to close borders and help the countries that migrants came from. EU leaders reached a deal on migration last week. However, differences remain over its implementation. 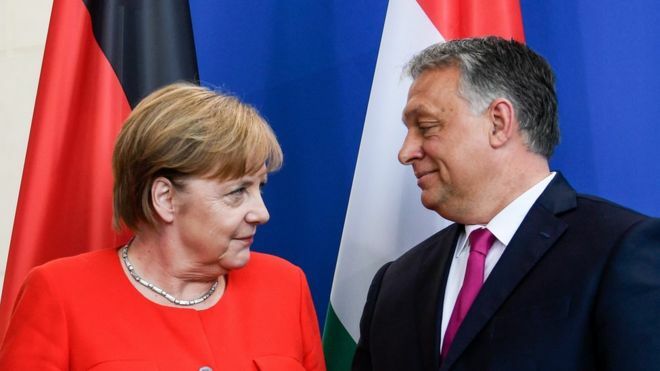 The two leaders embody the EU's split over migration. Germany allowed a million people to enter in 2015, while Hungary has so far rejected a scheme to relocate 160,000 refugees from overcrowded camps in Greece and Italy.